The writing sheets that accompany the Froggy Match-it reading and spelling games are ready and on the website. The phonics app will be available very soon, but you can try out these educational writing sheets right now. They are completely free! The phonics games help children to learn to read and spell competently and the sheets focus on the phonics words they are learning with the game. With the writing sheets, the children use the reading and spelling skills they are developing through the interactive phonics game, spell words in sentences and practise their handwriting. This is really useful for children learning to read and spell, and it’s all for free! There are ten writing sheets for the introductory level and for each of the seven main levels of the Froggy Match-it phonics game. 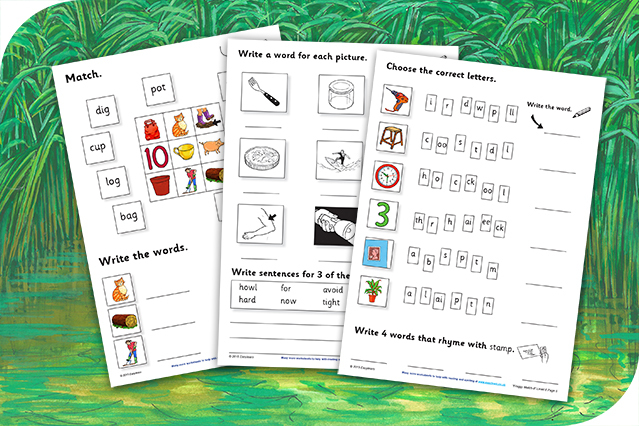 The introductory and level 1 sheets are ideal for young children who are just beginning to learn to read and spell words. Have a look, have a try! Download the sheets you want from our writing sheets page now.